When I first saw Elle Fowler's video "plan with Me" weeks ago, I had been researching about the planner that she used. Erin Condren Life Planner. Having a planner brings back a lot of memories and joy during my high school year. My best friends and I would decorate our planners with stickers and colourful pens. Pictures too! Youtube was my researching trusted source. *lol* I got addicted watching a lot of reviews, plan with me videos and recently, Etsy sticker haul videos. In fact, I have actually bought from two sellers recently and still waiting for the stickers to come. One is from Australia and another one is from US. Most sellers in Etsy are from US anyway so shipping is a bit of a pain. I'm looking for Australian sellers so the shipping is much reasonable. Oh back to the planner. At first I did not want to get the planner because of the weekly layout. I prefer to see a monthly overview. But my current planner has a weekly view now so I thought I should just try it. My mom and my sisters want to have this too. My next item would be the Deluxe notebook planner which currently you can add a year calendar (worth US$15) for FREE for a limited time. I'm so tempted to get the notebook for work!!! But I think I'm gna place an order for my mom and sister first. I have a $10 off coupon code (see sidebar) if you want to place your order from Erin Condren website. Shipping cost is super reasonable in my opinion. Etsy shipping cost are slightly more expensive, although it actually depends on the sellers. I'll share with you guys my weekly spread once my stickers have arrived. Oh! I have bought washi tapes from Asanty collection too recently. 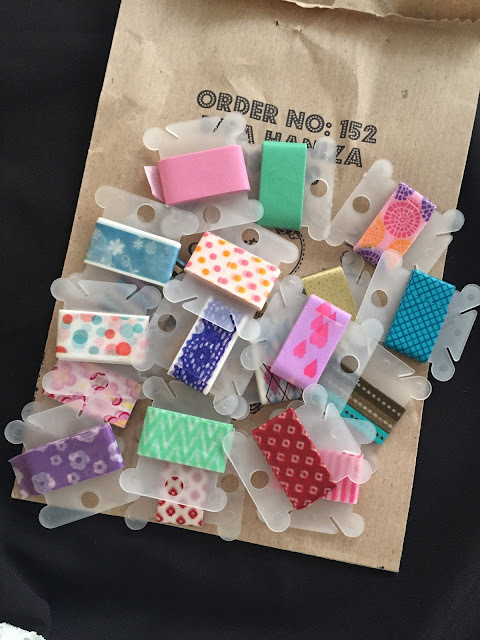 *grins* I have some washi tapes in my eBay cart at the moment. Haha I'll place my order soon. Oh myy.. This is definitely an expensive hobby! It's so cool that you got a customized planner! I wish I could get one, it looks amazing! Especially the designs! Wow!